Book Review: Son of Hamas – Called. Convicted. Converted. The Palestinian, Mosab Hassan Yousef describes himself as “a son of that region and of that conflict … a child of Islam and the son of an accused terrorist … a follower of Jesus.” A native of West Bank region of Israel, memories of the massive graveyard in his town and his father’s devotion to Islam tug at his thoughts. Politics and violence entered the fray. To fight Israeli occupation and to establish some kind of order in their chaotic Palestinian society, in 1986, when Yousef was eight years old, his father and six others formed the radical Islamic group Hamas. At eighteen years old, Yousef was arrested. He describes in details his prison time and the injustices he witnessed. Hoping for pardon, he agreed to become an agent for Shin Bet, the Israeli security service. Initially his plan was to turn on the Israelis at his first opportunity. However, after witnessing the cruelty of his own Hamas cohorts toward each other behind razor-wire fencing, he began to rethink his position. When he was released from prison he went undercover, rising in the ranks of Hamas while collecting intelligence to help bring it to an end. He prevented assassinations, stopped suicide attacks and provided information leading to the arrests or killings of many terrorists. It was during this time (from 1997-2007), that he remarkably met Jesus. God saw to it that in 1999 he had a encounter with a British visitor who invited Yousef to learn about the Christianity. Yousef took this opportunity and was blown away by the difference between Jesus Christ and Mohammed, between the Christian faith and the Islam of his people. In the months that followed he slowly converted to Christianity and was baptized. In this turmoil and complexity Yoused was being drawn by God. Providentially God saw to it that a New Testament made it into his hand. While he still deeply respects and loves his father, and loves his people, he ultimately discovered that Jesus is the Truth; thus he left father and people to stand with Christ. Eventually Yousef grew weary of his double life and convinced the Israelis to release him from his clandestine life. Reluctantly they agreed and Yousef moved to the United States where still lives to date. 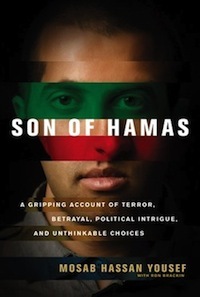 Son of Hamas is the story of his life, “A gripping account of terror, betrayal, political intrigue, and unthinkable choices,” according to the subtitle. 1. It shows the Israelis not as the good guys but as the less-bad guys. He grows in respect for them when he sees that they are fighting for their lives against nations determined to destroy them. However, even though there is a good cause, one sees how on the ground that often translates to torture and killing. In the end, in war, even the supposed ‘good-guys’ are sinners. 3. This book made me rejoice again at election. God’s Word accomplishes what He sent it to do. What an unlikely convert. But God reached in and saved the son of the founder of an Islamic terrorist group. This book is well worth reading. Get a copy and wonder at God’s grace. Rejoice as you see how God woos and draws a man through the circumstances of life. Excellent review Tyrell. Makes you think of Paul in his persecutions of the Christians, eventually being converted himself. I read this book some time ago and enjoyed it. I’m now eager to read it again. And yes I also rejoice at election and this unlikely convert. Glad to hear that Marianne. Hope you enjoy it as much the second time round. I greatly appreciate my brother sharing an abstract of this book with us, if he had not I probably would have never heard of it? I pray for ministry to that wonderful people group Abba has called you to lead!